I love my iPad. I still have the original iPad. You can read my logic on not upgrading to the iPad 2 in my piece last August..."No idea why someone would buy any tablet other than an iPad". And that argument holds true for a couple more months until the iPad 3 is introduced. But that is not what we are going to talk about here. After I ordered this latest Air a few months ago, I really started to have buyers remorse. I was scared that while the reviews and my own experiences at the Apple store indicated that the new processing power in the Macbook Air would have enough juice for my somewhat hefty needs...I was still concerned that such a small computer would not meet my power needs. While waiting the couple weeks for my Air to arrive, I was looking at the other Macbook and even PC options with more horsepower/ memory and was starting to sweat my potentially bad decision. You see the Macbook Air is physically limited to 4 gigabytes of RAM and a dual-core processor instead of the quad-core found in most newer Macbook Pro's. I would say I push a laptop pretty hard. I run quite a few programs concurrently. It is not unusual for me to have a few Microsoft Office applications (Word, Powerpoint and Excel) all going. Adobe's Photoshop and/or Apple's Aperture photo management software. And during a work day, I will have VMWare's Fusion virtualization application that allows me to run Microsoft Windows 7 and some work PC applications. Well, I am happy to report as I earlier proclaimed my affection for this very sleek laptop which seems to handle everything I throw at it. It runs like a champ. I couldn't be happier. Slim, lightweight, instant on and all around great product to take it with me no matter where I go. Others must be having similar experiences because nearly all the PC manufacturers at this year's Consumer Electronics Show (CES) were all about this form-factor being called an Ultrabook. Now Ultrabook is a branding initiative by Intel to generate a lot of buzz about a product offering that falls between a tablet and a laptop. Truth be told, the Macbook Air and these Ultrabooks for the most part are slimmed down laptops with a new generation of capabilities, power conserving mobile computing processors and for the most part fast, instant-on solid state hard drives (SSD). DVD drives and the like are getting replaced with SD memory slots and online connectivity. There is also the belief that as software evolves we will begin to see a truly new category of hybrid computing devices. But for now, I am happy to get a powerful computing device into smaller configurations. There is also a realm of tablets trying to transform themselves into near PC functionality when you attach a keyboard but currently their roots get in the way and you end up with just a tablet and a keyboard. 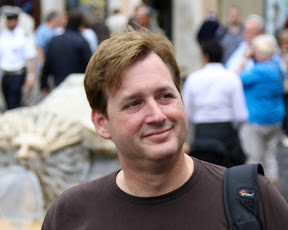 The experience didn't evolve beyond the basics of the tablet's operating system whereas these Ultrabooks may provide PC consumers with the benefits similar to the Macbook Air...sharing and manipulating data across multiple applications. This year HP really hit it out of the park with the design of the new Envy 14 Spectre. You have to see this thing to really appreciate the beauty of its design. 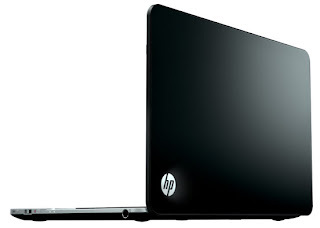 It is a slick execution of glass inside and out that creates a very unique black glossy 13.3 inch chassis which HP indicated makes this premium Ultrabook more rugged and scratch resistant. Included is a 14 inch (1600 x 900 resolution) diagonal LED display, Intel i5 or i7 CPU and an upgrade option of an solid state disk (SSD) drive. All this does make the 20mm Envy a bit thicker than its Ultrabook peers and a fair bit heavier at just under 4 lbs. Form over function? You should also be warned that all this finery comes at a price...starting at $1,400! That is more than a similarly equipped Macbook Air which Apple tends to be the premium price leader. 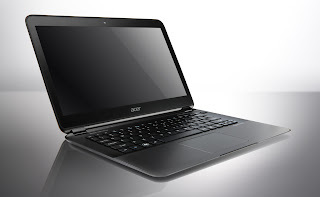 On the opposite extreme, the Acer Aspire S5 is an amazingly shocking pieces of hardware that currently is one of if not the thinnest Ultrabook. Measuring only 15 mm at it's thickest point, weighing less than 3 pounds and featuring a 13.3 inch display is quite an overall feat of computing engineering. I guess squeezing a computer down to that size does cause some compromises along the way like a monitor resolution of only 1366 x 768 which is not anything to write home about nowadays even with a 13 inch display. That said, this very small computer does come with a nice complement of capabilities including an SSD storage drive featuring an Instant On capability that takes the computer from sleep to on in 1.5 seconds and a host of connection options such as HDMI, USB 3.0 and a 10 Gbps Thunderbolt port. The packing is quite smart looking all wrapped up in an attractive onyx black magnesium-aluminum alloy cover. Look for Acer to start shipping the S5 in the spring. Not to be left out of the mix, Dell's XPS 13 Ultrabook is a very nice piece of hardware measuring 18mm at its thickest point all the way down to only 6mm on one edge! The 13 inch diagonal display is compacted into this small 12" laptop. The Ultrabook has a nice quality feel to it consistent with most Dell computers and is made from carbon fiber and aluminum. These construction components help lighten the load and results in the XPS 13 weighing only 2.99 lbs. 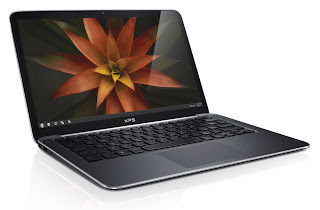 Consistent with other Dell computers, you will be able to configure yours with a range of options including memory, the choice of Intel's i5 or i7 processors and either a 128 or 256 gigabyte solid state hard drives. The 13.3 inch display is bright and clear but it too is limited to the 1366 x 768 resolution. Other than resolution and a limited array of connection ports, this is the most excited I have been about a Dell in quite some time and am looking forward to spending some more time with one as it comes to market next month. Lenovo recently showed off some near-term consumer and business Ultrabooks but the most exciting product a very exciting Windows 8 laptop/tablet hybrid to be released later this year product. 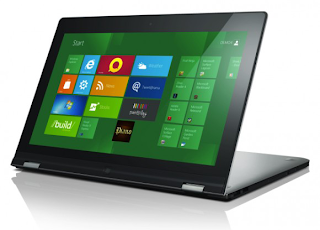 Not officially an Ultrabook, the Lenovo Yoga is a 17mm thin device that can be used as a laptop, tablet or flipped over as a kick-stand for watching movies. The display is a gorgeous 1600 x 900 LCD IPS with multitouch interface which is something not found on these other Ultrabooks. All this functionality for a retail price of $1,199 and available the latter part of this year. All of these are very promising computing platforms for the person on the go but wants a full operating system PC. Each serves a wide-range of uses giving you a great selection of personalization options to compare to suit your specific needs. And based on my time with them over the three days of CES 2012, I believe they are all worthy new entrants into the marketplace. If you need to pick-up a lightweight laptop today, I'd probably lean toward the Dell XPS 13 Ultrabook. It is a quality piece of equipment, offers a great range of configuration options in a very small and light form factor. If you can wait until the latter part of the year, I am expecting a great deal of innovation to come forth as Windows 8 rolls out. I see Windows 8 as a game-changer and current PC designs will change a fair amount to take advantage of the new operating systems capabilities. Though Microsoft was incredibly quiet about a release date for Windows 8...the stars seem to be lining up for a late fall (October'ish) release. I'll keep you posted as these and other mobile computing products come to market throughout the year.